1 Party for KCR - 19 Parties for Sonia! As many as 19 Political Parties attended the dinner hosted by Sonia Gandhi to strengthen UPA by 2019 Lok Sabha Polls. The call given by Telangana CM K Chandrasekhar Rao about the necessity to form Third Front irked Congress more than BJP. TMC Chief and West Bengal CM Mamata Banerjee extended support to KCR and turned down Sonia's invitation. So, All eyes were on Sonia's dinner meet to check how many parties will be part of UPA. Finally, Congress managed to put a good show and it means KCR have an herculean task ahead. 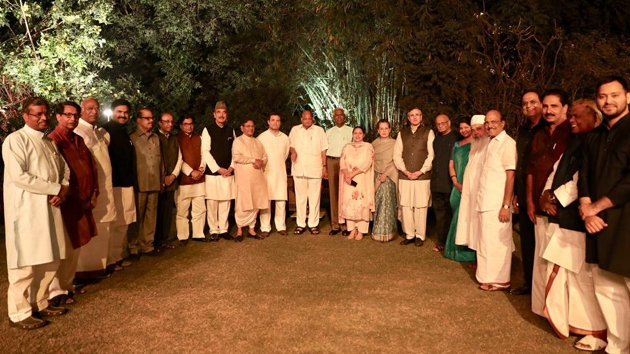 Apart from Sonia and Rahul, Congress Key Leaders Manmohan Singh, AK Anthony, Ahmed Patel, Ghulam Nabi Azad and Mallikarjuna Kharge have been present. There is clarity over the stand of 18 out 19 parties which attended the dinner meet. Supreme Sweet News On Aadhaar Linking! Runway 2 or 20? Confusion killed 49 People!